There are spoilers in this review. I repeat, spoilers be here. Seriously, do not read further if you want to be surprised. Still here? Alright then, grab your popcorn and let’s talk about Finding Dory! Speaking of popcorn, don’t you love the combo pack pictured above? Our local theater had this for $5.50, which includes the commemorative cup, popcorn bucket and some candy that is hiding behind the cup in the photo. This is sized for a child and was a fun way to get in the mood for the movie. Here is the quick plot summary. Dory remembers her parents. She, Marlin and Nemo set off on another adventure to find them. The journey across the ocean to where she remembers her family is skimmed over in a two minute visit with the sea turtles. The rest of the movie happens in or near an aquarium on the coast of California. Dory finds old friends and makes new ones while finding her parents. In the end, Dory’s parents and new friends return with her to live happily ever after with Nemo and Marlin. 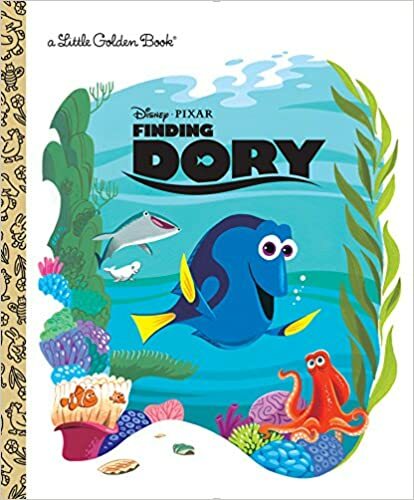 So we cheated a bit by getting the Little Golden Finding Dory a few weeks ago and reading it to our daughter before seeing the movie. This is a tradition in our home dating back to Frozen. Before a new animated movie comes out in the theater, we get the book for it and read it multiple times before seeing the movie. Reading the book first may have been a mistake for Finding Dory. For the others – Frozen, Inside Out, Big Hero 6, Zootopia, Good Dinosaur – the plot was just the beginning. The characters came alive in the movies, adding dimension and depth to the story. I did not find that to be the case for Finding Dory. To be fair, I enjoyed the messages of the movie. Some of the key themes that stood out to me included our differences can be our strengths, families are composed of loved ones and when in doubt, just keep swimming. It was fun to revisit old friends. Some of the new characters, especially the septopus Hank, were entertaining. Mostly, the bulk of the movie was a comedy of errors with Dory traveling in a coffee pot, cup of water and baby sippy cup to get to her parents while Marlin and Nemo followed suit with the aid of a very different bird and some dancing water fountains. Hank the octopus was a textbook grumpy old guy who learned to face his own fears while helping Dory against his will. Dory’s childhood friend, Destiny the Whale, also helps along the way while conquering her own challenge with sight. Surprisingly, given how much my family has enjoyed most of the recent Disney/Pixar animated films, this one was not a winner for us. I had a very hard time taking it even remotely seriously. My husband lost interest after the first fifteen minutes and our six year old daughter was more bored than enthralled. However, don’t take my word for it. Go see it! Even if the movie itself does not grab your attention, there are two gems that come along with the show. The first is the short Piper. The detail animation so closely approximates real life that I had to look closely for the first minute to make sure it was going to be an animated short. It was a great short! Also, those who wait through all the credits at the very end will get a nice surprise. To finish this post, here’s a clip of a couple of sea lions who provide a familiar type of comic relief. Enjoy!